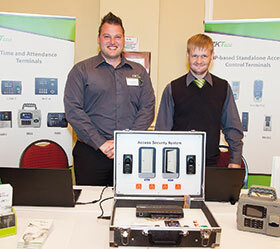 This year ZKTeco South Africa provides the residential estate security sector with the latest innovations in biometric technology. ZK has developed products that provide residential estates with a platform to integrate access control devices with visitor management apps. The ZKBioEstate solution (part of ZKBioSecurity) makes use of UHF readers, car tags, parking barriers, full height turnstiles with fingerprint and RFID access control systems. All these can be monitored on one platform: ZKBioSecurity. The UHF reader is waterproof and is suitable for use in a wide range of RFID applications, such as transport management, vehicle management, car parking, production process control and access control. The ZK parking barrier prevents entry of unauthorised vehicles to restricted areas. It is raised by the linkage between the gate, the remote control, access control system, long distance reader and number plate recognition system. The LED light tape changes colour in boom raising or lowering, thus helping the driver avoid hitting it, and a pressure plate ensures that the barrier gate doesn’t close too soon. The biometric full height turnstile with fingerprint and RFID access control system, which features a modular design, visible indicator, semi-automatic mechanism and SUS304 stainless steel cabinet, ensures that pedestrians entering into the estate can also be recorded. The new ZKTeco visitor management app not only enhances efficiency, it ensures that visitors can be registered within seconds, with all necessary information captured. The app enables authorised personnel to preregister visitors, thus helping to streamline the waiting process. This app also ensures that the handling of visitors is in accordance with estate policies. Visitor approval is sent to the authorised person via the app and the proper access rights can be assigned. All information is stored in a secure database and can be conveniently retrieved for repeat visits. This visitor management app also allows the user to track visitors, assets and deliveries as they enter and exit the premises. It helps improve the efficiency, productivity, security and visitor service of any residential estate. ZKBioEstate is a comprehensive security package offered by ZKTeco that can complement any residential estate and can be customised to fit the specifications of any estate.